better lather,rapid drying and will last longer than any animal hair ever could. The F&L ONE ensures optimum shaving performance and comfort. desire, whilst remaining understated and effortlessly chic. Intriguing and intuitive, at home or on the go, the F&L ONE shaving brush system is timeless. Intriguing and intuitive at home or on the go, the F&L shaving brush system is timeless, sophisticated and luxurious. This 100% hand-finished brushed anodised aluminium body is durable and rust resistant, forming a strong geometric silhouette that is as tactile and comfortable as it is visually appealing. 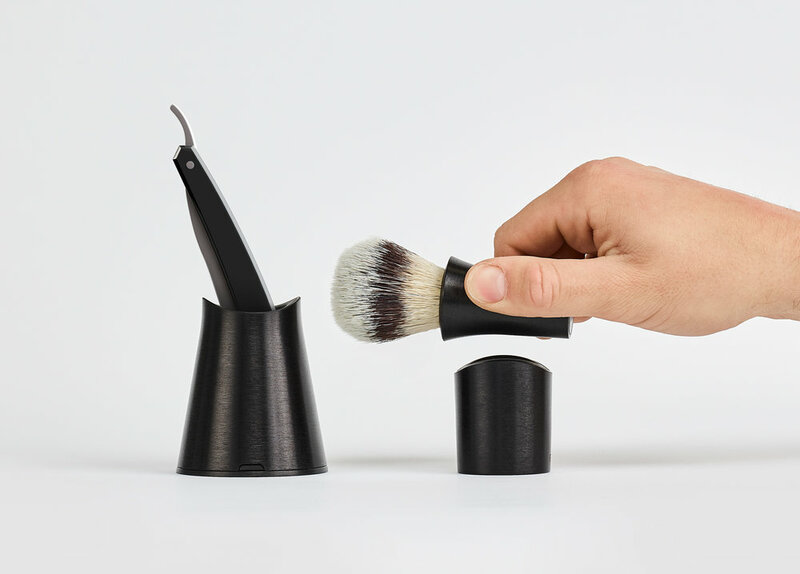 This unique system consists of three integral elements; the shaving brush, a stylish stand that accommodates any size or type of razor, and a stylish razor stand. The stand encourages increased airflow to the bristles, shortening drying time for ultimate convenience whilst also ensuring the product’s longevity by doubling up as a brush case to protect the bristles when travelling, the razor dish pairs effortlessly with this to form a lid to the case when in transit. Designed with endurance, practicality and style in mind, ‘ONE’ fits effortlessly into your modern, globe trotting lifestyle. Crowned with the best quality synthetic fibres the brush replicates the elite properties of Silver Tip badger hair, whilst remaining badger friendly. Soft to the touch and gentle on the skin, the fibres are strong enough to distribute a rich and creamy lather that efficiently softens and raises the hair providing a close, comfortable shave every time.